Paper bag manufacturer AB Group Packaging has introduced a heavyweight paper bag at the Packaging Innovations 2017 event held earlier this month in Birmingham, UK. Certified by Programme for the Endorsement of Forest certification (PEFC), the 100% recyclable paper bag features unique ultra-strong quality, allowing it to carry up to 37lbs in weight. Made using more durable, than standard papers, the paper bags have soft hold handles and can be supplied with a colored handle option. The bags, which are both water and tear resistant, will be manufactured in custom sizes with custom branding options. 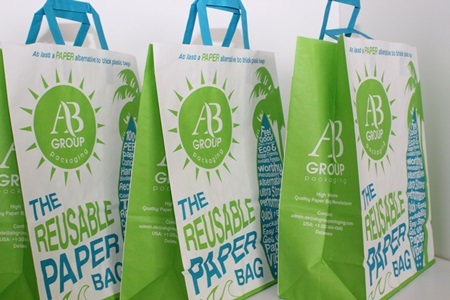 AB Group Packaging managing director Dermot Brady said: “Companies offering these bags to customers in store can be assured that they are choosing a responsibly sourced, renewable paper alternative choice to thicker plastic bags. The paper bags are developed using large side gussets, allowing them to sit upright and open easily for fast, easy packing. Additionally, the bag allows customs to fold neatly and store it for reuse. AB Group Packaging manufacturer high-quality printed paper bags and flexible packaging including sustainable carrier bag solutions for both national and international brands. The company owns and operates manufacturing plants in Ireland, the US, Spain and the UK. Image: AB Group’s new heavyweight’ paper bag. Photo: courtesy of PEFC UK Limited.